You know they’re is an old saying that goes like this, “the apple never falls far from the tree.” No matter how much we try as children to march a different path than our parents. Yes we rebel in our teenage and early adult years, but for most people they become their parents. We claw our way into finding our own sense of individuality as adulthood becomes the norm, until you wake up one morning and scream. Even in the world of DC where legacy is king, certain characters can’t escape their future. Warning they’re will be spoilers going forward. You have been warned. Now maybe it’s just me, but while I am loving Soranik’s turn to the dark side I feel like I missed something. 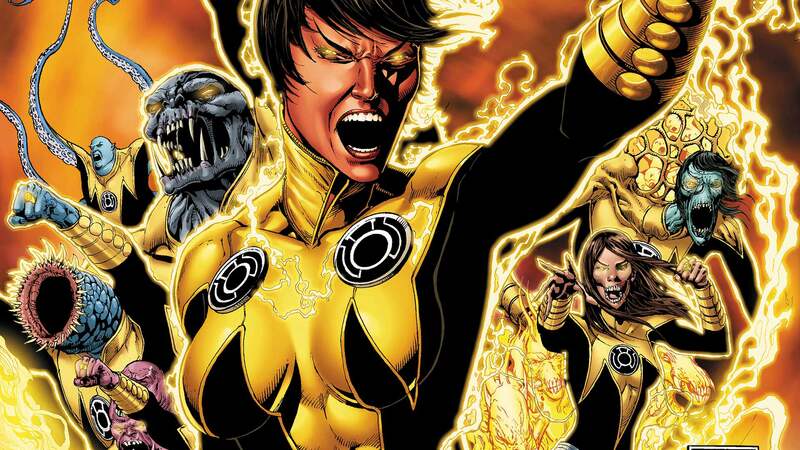 During this short alliance between yellows and greens, Soranik has been at the forefront of trying to turn what her father started into a force of good. Yes I understand that Kyle lied to her about their future son, and she has every right to be angry. However the complete 180 degree turn left me scratching my head. Until I finished the issue and this is something I won’t spoil, but let’s just say Soranik’s twisted turn makes a bit more sense to a degree. I could be reading to much into it, but regardless it leaves her in a interesting position. I honestly doubt that Venditti has read any of my reviews (and I honestly don’t blame him), but I can’t but feel that he must have realized that the full potential partnership between these two warring factions didn’t live up to certain expectations, so perhaps that could explain why the Sinestro Corps memebers were so quick to turn back to their villainous ways. Maybe that’s why Venditti never really devoted time for individual members to form bonds, when ultimately this issue is where the buck stopped. Now I understand why the emphasis was put into Guy and Arkillo’s weird friendship, I actually felt a bit depressed knowing that we won’t be seeing their odd friendship anymore. Since this initial battle was just a skirmish, I can’t help but feel that these two characters will clash again and then emotion volume will be turned up to 11. Despite my lukewarm feelings at the start of this arc, this concluding issue solidified it as a damn great Green Lantern story. A lot of that can be attributed to (once again) Ethan Van Sciver on pencils once again. I’m like a broken record at this point, but each page, each panel is just gorgeous. Even though Van Sciver will disappear for a while, but that’s okay because I’ll take an arc of stellar art instead of subpar art from him. While it was pretty obvious that it was Tomar-Tu who killer his Sinestro counterpart, him surrendering his ring was heart breaking. I honestly can’t recall seeing a Green Lantern forced to give up his ring. Even if you aren’t well versed into the history of Tomar-Re and his son Tomar-Tu, enough context for new readers to feel the same pain veteran readers might be feeling. You add all these elements with a huge cliffhanger reveal and you have one amazing issue of Hal Jordan & The Green Lantern Corps.